Glory to God in the highest! You sent your Son to be born in humility and lowliness so he could live and die for us. Open our eyes to behold his majesty hidden in meekness and his divinity hidden in flesh. This is the Christ! This is our Lord! This is our Savior! Born for us. Amen. How many babies were lying in mangers that evening in Bethlehem? It would’ve been a rather distinguishable sign, right. But who would’ve ever conceived it? A child laying in a feeding box for animals? And this child was the Savior, the one promised for thousands of years? The Christ in flesh? The Lord himself? That sign probably would’ve been enough, but the angel wants to push those shepherds on to go find the baby in the manger, their Lord and Savior. And so, the night sky lights up with thousands, maybe millions, of angels who sing a song for the praise and glory of God, and proclaim that his peace and favor rest on the people of the earth. And that’s a big enough sign for those shepherds to run into Bethlehem and search every manger in town until they found the one with a baby lying in it. And when they found him, they couldn’t help but go tell everyone they could about the amazing things they had just heard and seen. Tomorrow evening, on Christmas eve, we will again get to hear the angel announce his birth. We’ll stand by the shepherds with mouths agape as the dark, Bethlehem sky is filled with the light and song of the angels. We’ll again get to hurry off to the manger to worship our newborn King. We’ll again be filled with such joy that we can’t help but want to tell about the newborn Savior that is good news of great jot for ALL people! 1. Imagine you are with the shepherds that night outside of Bethlehem. What would you have felt when the angel first appeared? When he announced the birth of the Savior? When the sky lit up with all the angels praising God? 2. Share with your family what your song of praise would be if you would’ve knelt beside the manger that night with the shepherds. 3. What are you looking forward to most about worshiping tomorrow night on Christmas Eve? 1. Read Psalm 148. 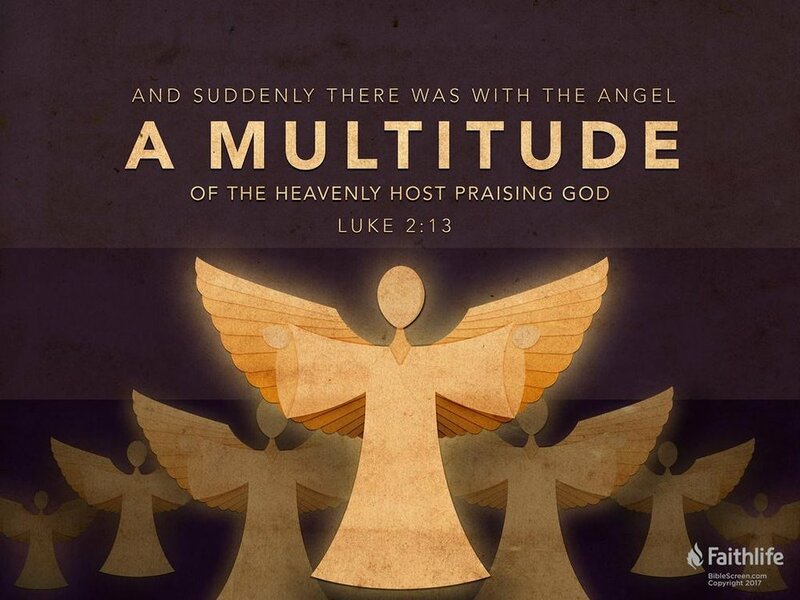 As the angels sang the praises of God that first Christmas night, this is a song of praise to the LORD of heaven and earth. What does this psalm teach you about God’s power? God’s care? God’s goodness? 2. Read verse 14 again. Who is the horn that the LORD raised up for his people? How is this horn, “the praise of all his saints”? What does the phrase “people close to his heart” tell you about God, and you? Lord Jesus, along with the shepherds, fill our hearts with joy over you birth. Put praise on our lips and speed in our steps to go and share this good news of great joy: A Savior for all. Amen.